Adults seem to have an easier time pointing fingers at child bullies than at adult bullies. There’s a notion that children are bullies by nature. Wrong. Adults often don’t realize that child bullying is learned from adults. Bullying attitudes are built into mainstream ideas about parenting. Don’t fall for them. Bullies are paranoid and think that others are out to get them and so act aggressively to prevent harm to themselves. It’s like “prevent defense” in football, where players use aggression to prevent aggression. Some parents bring the same kind of distrustful attitude to their parenting: Paranoia about being manipulated. When parents think their baby is out to get them, to manipulate them, to control them, they adopt the mindset of a bully. They ignore the baby’s communications about needs (for touch, movement, conversation, breast milk) because they attribute intentional power-plays to the baby. They view parenting as a power struggle — between the poor helpless parent and the all-powerful manipulating baby. Huh?! Yes, crazy thinking! But such distorted thinking is encouraged by other baby-paranoids and experts who encourage parent-against-baby attitudes. Bullying is typically defined as unwanted aggressive behavior “that involves a real or perceived power imbalance” (from stopbullying.gov). 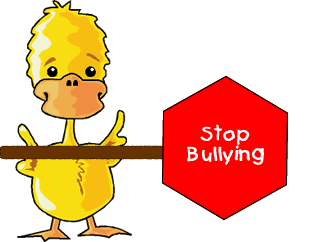 Usually bullying is seen as an act of commission (taking action towards another person). But the Free Merriam-Webster Dictionary online says it is “A blustering browbeating person; especially one habitually cruel to others who are weaker.” I would like to suggest that bullying can also an act of omission: A lack of expected or needed action toward one who is weaker. And yes, I point to babies as the weaker party. Instead of understanding that the very physical needs of babies are “built in” by evolution millions of years ago, too many adults minimize the needs of babies and want them to behave more like plants in the corner. When babies don’t act content with minimal attention based on the adults’ schedules, some adults adopt a bully mindset and begin a power struggle. Instead, the best course is to humbly give in to the needs of the baby from the beginning. It can seem like babies need a lot of care but, from another perspective, not really. Human babies should really be in the womb another 9-18 months (to reach the level of maturity that other animals have at birth), so they expect the equivalent of “external womb” care during the first year of life. Babies essentially want to hang around (preferably on) mom and dad and other trusted, reliably responsive caregivers. What they expect is constant physical closeness, movement, feeding at will, but also social communication (Note: these practices are all related to how well babies’ brain and body systems develop, which influence wellbeing and intelligence for a lifetime; see Narvaez et al., 2013; 2014 in the references at the end of this post). Such “on-body” care is not that much to ask for from someone used to carrying young children and responding to their needs automatically. But for the inexperienced and for those in cultures where babies are isolated from workplaces and the rest of the community, it can seem like an enormous task. So it is best to prepare oneself before one becomes a parent for the velcroid experience of caring for a baby as evolution designed (See: Raising a Baby Well: Like Climbing Mount Everest). There might be a critical starting point for a bullying attitude among parents, just as there is a critical period for the development of an abusive pattern in domestic violence. In domestic violence, when the first incident of spousal battering is caught and condemned, (e.g., arrest), the abuse is less likely to reoccur (Maxwell et al., 2001). The partner is less likely to ever do so again. But if no one sees or stops him or her, the pattern has begun and is more likely to continue. I think that maybe something similar happens with attitudes towards babies. The cascade of bullying babies may be instigated in medicalized birth (99% of USA births since about mid-20th Century). In US hospitals, it is very common to do things to babies that make them cry in fear/anger/panic/pain (e.g., separating them from mother; poking them; suctioning their lungs; rubbing them harshly, putting them in bright lights and smells…see Liu et al., 2007 below in the list of references). I suspect that when parents see the rough treatment of the baby and the unconcerned, non-responsiveness of the medical staff to a baby’s cries, the parents’ minds get imprinted with: “It’s normal to treat babies harshly; it’s normal for babies to cry; it’s normal to ignore those cries.” This may be the first step on the path toward insensitive parenting. And then with encouragement all around to “get your life back” and “you’ll spoil that baby,” parents second-guess their own compassionate intuitions and move down the pathway toward less responsiveness. It is not just particular parents, but the whole society that is influenced by insensitive medical practices toward babies. Just like beating your wife used to be considered “normal,” a crying baby is often considered “normal” in the USA. But neither are “normal” from the scope of human existence on the Earth. No social mammals torture their partners or babies (and yes, I think ignoring a baby’s needs is a form of torture). Wise adults know that distressing a baby is bad for the baby and bad for the group in the short term (predator attraction) and long term (disordered adults). So every precaution is taken to keep the baby calm and quiet during those months when the brain is finishing its self-construction based on early support. This is unlike expectations and practices regarding what is called colic and desperately awful in the USA where babies are traumatized at birth and too often don’t get the treatment they evolved to need. Although fussiness might increase in the first months of life in small-band hunter-gatherer societies, there is still little crying, unlike the expectation (and ignoring) of so-called period of purple crying expected in the USA. (1) Demand that hospitals and medical personnel create soothing practices that avoid distressing babies. Baby-friendly hospital initiatives are a first step. (2) Support parents in their intuitions to be compassionate and physically close with their babies 24/7. (3) Assume that normal babies are quiet and happy and that a crying baby is a sign of something gone wrong. Babies are biosocial beings–their bodies, brains and sociality are built by experience with caregivers. It needs to be loving attention: Love Starts With Babies. So how is it that children first learn to be bullies? Initially from caregivers who behave unempathically towards their needs, starting in infancy. This is something we can change. Liu, W.F., Laudert, S., Perkins, B., MacMillan-York, E., Martin, S., & Graven, S. for the NIC/Q 2005 Physical Environment Exploratory Group (2007). The development of potentially better practices to support the neurodevelopment of infants in the NICU. Journal of Perinatology, 27, S48–S74. Maxwell, C. D. Garner, J. H., & Fagan, J. A. (2001). The effects of arrest on intimate partner violence: New evidence from the spouse assault replication program series – Research in brief. Washington DC: National Institute of Justice. Narvaez, D., Panksepp, J., Schore, A., & Gleason, T. (Eds.) (2013). Evolution, Early Experience and Human Development: From Research to Practice and Policy. New York, NY: Oxford University Press. Narvaez, D., Valentino, K., Fuentes, A., McKenna, J., & Gray, P. (2014). Ancestral Landscapes in Human Evolution: Culture, Childrearing and Social Wellbeing. New York, NY: Oxford University Press. I love everything you are saying, however, I would hate to send the opposite message that any time a baby cries there is something terribly wrong going on or to encourage a parent to hover and anxiously anticipate and prevent any signs of distress in an infant or small child. There is a dance all parents and babies do together (normal range secure parents) when the baby is uncomfortable and fusses or exhibits protest behavior. This is normal, and the optimal response is for a parent to respond, though even the best parent might not read the babies initial signals perfectly every time, thus they would see an increase in protest behavior from the baby and continue to attend until they get it right, there seems to be about a 70/30 ratio in attuned parents. This IS normal. Letting the child’s distress it go completely ignored, getting angry at the child for the distress call, personalization or paranoid ideas about how the baby is trying to manipulate the parent is not a healthy attitude, agreed! When a baby fusses they are simply communicating a preverbal need; hold me, burp me, I’m wet, I’m scared etc. It’s not personal. I agree we have far too many parents who adopt the abuse/neglect approach and our society suffers for it. We also have too many parents in the U.S. that hover and fret and communicate their anxiety to the baby and act as though any show of distress by an infant is a major disaster that requires dramatic angst-ridden interventions, or to be prevented at all costs. This also interrupts important developmental tasks for the child’s optimal brain development. We are describing the extremes of the anxious preoccupied parent versus the dismissive parent. Not to mention parents who are disorganized and have unresolved trauma…the baby’s signals for assistance will likely be interpreted as hostile, threatening or fearful by folks on the extreme end of attachment styles. The sweet spot of course is in the middle of the extremes. Unfortunately our society continues to engage in cultural splitting behavior viewing complex matters as either all good or all bad, rather than taking a balanced perspective. Thanks for your note. My impression is that the miscare of babies is increasing and becoming the norm, not the rarity you seem to imply. Shifting baselines. One of the challenges is that the data we have from USA parents and children are not representative of the baseline of early care (which more appropriately should be from humanity’s 99% history in small-band hunter-gatherers). When parents don’t give babies what they evolved to need (e.g., carry their babies most of the time, make the breast available on request and for comfort too), then you get unhappy babies who are more dysregulated, creating distress in the parent. So then, as seems common today, parents (lacking understanding or support to do otherwise, or pressured to undercare for baby) have a tendency to go from one extreme to the other–from intrusiveness to detachment, making everything worse. Fewer and fewer children have secure attachment as parents have forgotten what babies need to grow optimally. The undercare of babies gets passed on to the next generation through parenting, unless parents revamp their own understanding and behavior. These posts are intended to expand imagination about the needs of babies, whose basic rights seem to have been forgotten. Specifically, I wrote “I agree we have far too many parents who adopt the abuse/neglect approach and our society suffers for it.” My post is clear and does not imply a belief that neglect is rare. Rather I offered concern about leaving out the what the research says about normal range secure parenting and normal protest behavior of infants. As a licensed therapist working with children under a child abuse grant, I see and work with the results of poor parenting every day, on the neglectful and intrusive ends of the spectrum, both. The parents who are the most severe in this regard usually carry their own unresolved trauma, often through multi generational transmission (agreed) and trauma involves the tendency to engage in splitting behavior which includes black/white thinking, all or nothing thinking. This is a well documented clinical concern, and a worthwhile issue to bring-up in this context as we educated the public about sound parenting practices. Best to you and thank you for the work that you do. This is an interesting perspective though I do not think that every baby who is left to cry becomes a bully. I would agree though that the consequential lessons of being left alone are negative. Being left alone to cry may also teach babies to learn to accept pain and neglect as a normal stages of life. What a great piece. As a volunteer for an infant-mothering group for many years, and now as a lawyer for abused and neglected children, the poor treatment of infants in this country is vastly overlooked. The implications for future physical and mental health are huge. The poor treatment cuts across socio and economic lines from the low- income teenage mother telling her baby that she is bad and getting offended because she cries, to the corporate executive with a scheduled, for-convenience C-section, who goes on vacation without baby just weeks after birth, Yet, people still think that the babies do not know what is going on and what happens to them has no impact. The first three years are so critical. Abuse is abuse. The word bully is very popular now that we have found our scapegoats in 11-year-old boys. I am glad you thought to apply the word bully to patterns of parenting – it works very well. The bigger question is what do we do about generational currents of the trauma/abuse cycle? I don’t know what made my grandfather into such a horrible being. He was brilliant – an artist, a chemist, a musician, …. and a sadist who had 12 children. I want to relate one story in order to back up your claim of parental bullying. My mother was the first born and remembers her baby sister crying one night. My grandfather refused to let my grandmother feed and tend to the baby. Instead, he put the child in the bathtub and let her scream all night as five children and my grandmother had to listen. Can you imagine the damage that was done to all involved? This instance is only a drop in the bucket to what went on in that family, and it all passed on down the lines. Nothing could stop this freight train of evil. I am so grateful for the right to choose whether or not I bring a child to term. Because of that choice I did not have to bear the burden of becoming a perpetrator nor the agony of giving up a child for adoption. My entire life has been spent trying to heal the ravages of my brain, body and spirit – looking for healers who can help me out of this pit. I think perhaps there is some hope now, but the path is overwhelming.